Description: The soundex system is a method of encoding names so that similar sounding, but differently spelled names will have the same code. 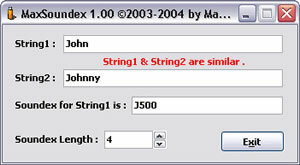 For example the names John, and Johnny have the same soundex code.The program is a soundex calculator. For more info about soundex please search on the internet.